Mayor Bloomberg spent 73 million wingwangs on his previous election campaign, already spent additional 23 mil on reelection and is rumored to be willing to go as high as 100. So basically the cost of New York City mayorship is about equivalent to a trip to the moon. That much money could probably help a little bit in balancing NYC’s budget or go a long way in building a new kind of a spaceship (or a space elevator even), but maybe once you have that much money you might want to spend it on what gives you the greatest pleasure, and not the most useful application. Speaking of circumlunar trips, if the 100 million private trip will ever happen, it will only be a second commercial trip around the Moon. 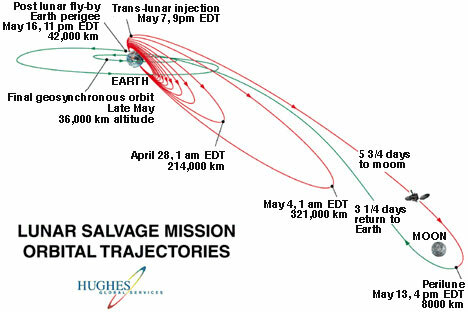 In 1998 a Hughes satellite got stuck in a wrong orbit because the last stage of a Proton booster cut out too early. The insurers wrote it off (200 million, or two NYC mayorships) , but allowed Hughes engineers assisted by two former JPLers, Rex Ridenoure and Ed Belbruno, who came up with the idea, to try something unusual — a lunar swing-by using the satellite’s onboard propellant. They used a trick similar to the one that saved the stranded Apollo 13 astronauts, to bring the satellite through a few figure 8 loops around the Moon and settle it into correct geostationary orbit. Off the shelf software made by AGI was used to make calculations. I actually have a mug from AGI proudly sitting on my desk. Every time I look at it I remember this story about some smart people and good software that saved a 200 million dollar satellite.